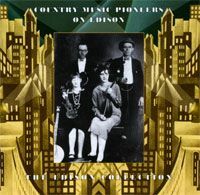 Edison CDs available on Document Records. The first in the un-issued Edison series features such artists as Fiddlin' Powers and Family, Posey Rorer and the North Carolina Ramblers, Carson Robison, Vernon Dalhart and many more. Almost since the time that recording sound became a reality, record companies both large and small continually sought out new idioms of entertainment to keep ahead of their competitors. For some unknown reason, however, country music recording was continually overlooked - citing it more as a folk tradition, than an actual vehicle for profit. The 1920's were a period of discovery, a time in which the treasure of Southern music was unearthed both by imaginative record company executives, and the pioneering artists eager to provide it for them. It was then marketed on record to an enthusiastic national audience. From World War Two forward, however, the music industry consolidated it's professionalism and gradually centred it's creative energy in Nashville Tennessee. In this age of multi-track studios, digital enhancement and sterile sounding recordings - it is truly a joy to take a step back in time and listen to the men and women who shaped this musical art form into the billion dollar industry it has become today. It is to them that this is lovingly dedicated. Jazz And Blues On Edison Volume 1 featuring such artists as Viola McCoy, Mal Hallet, Clarence Williams & Eva Taylor, Rosa Henderson, Nobble Sissle with Eubie Blake and many more. Edison "Needle Cut" Recordings Volume 1 featuring such artists as Roy Smeck, BA Rolfe, California Ramblers, Harry Reser, Carson Robison and many more.